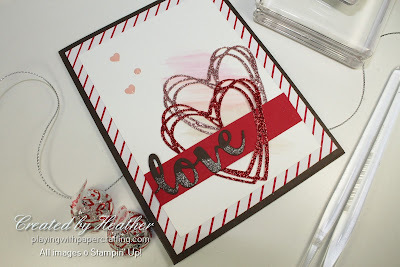 With a delicious colour combination from the Colour Throwdown Challenge folks, I was ready to go to it! I mean, look at that inspiration photo! 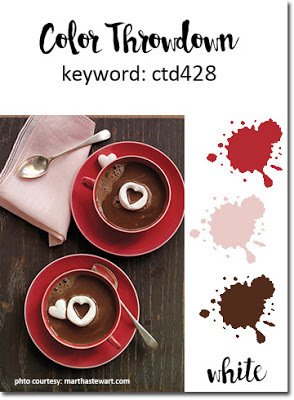 Red, pink, chocolate and white! Tomorrow, I have a Mom & Me class and I needed a project for the moms to do on their own. I thought they would have fun with this one. I started with an Early Espresso base and layered it with a simple striped panel from the Sending Love Designer Series Paper Stack. I got out my Watercolour Pencils and Aqua Painter and did a little watercolour scribble on the Whisper White background. I had to use the pencil colours available. The Real Red and Early Espresso were perfect, but the only pink is Melon Mambo and it's a wee bit off Blushing Bride But with water from the Aqua Painter and the Real Red mixed in, it tones down considerably. You have to be really careful not to add too much water to this on the Whisper White, just enough to blend it and move the colour around. 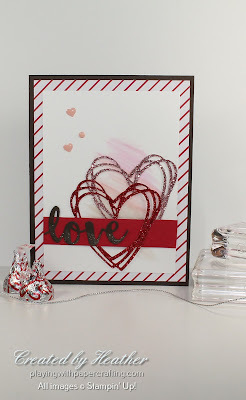 I die cut the hearts from Red and Blushing Bride Glimmer Paper. 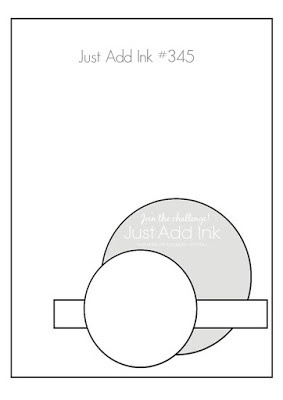 It worked better to die cut the back of the glimmer paper. It just preserved the glitter finish and it was easier to cut and to get out of the die. The word love is also part of the Sunshine Wishes set and it is cut from Early Espresso here with clear Wink of Stella added to only the lower part of the letters for a different look. The Fine Tip Glue Pen was perfect for gluing all the small areas on to the project. It was especially tricky gluing the banner, word and red heart on as they are interwoven. I glued the heart and word to the banner and then glued all to the project. 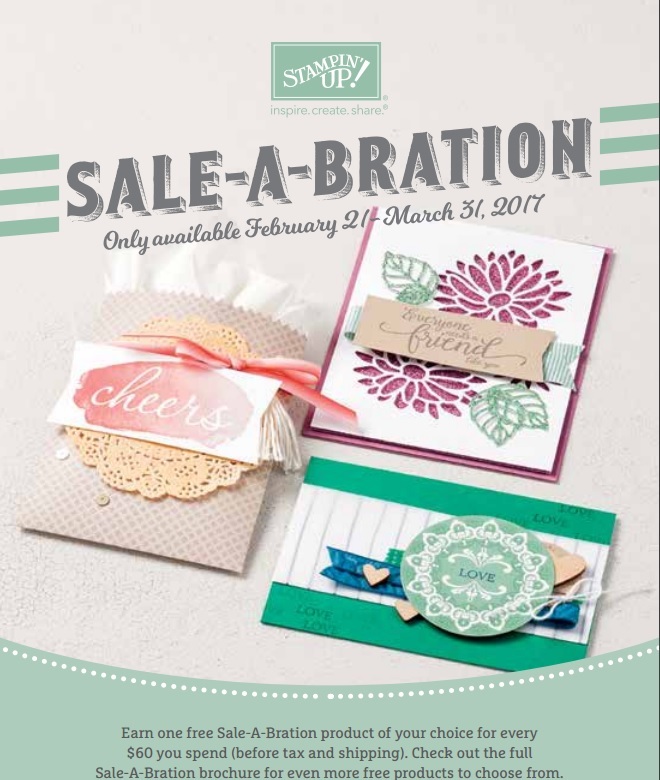 There are three new Sale-A-Bration Rewards being offered starting Feb. 21 and you can see a little sneak peek here! Check out that glimmer paper in particular! I think it's going to be a best seller! More on these later!